Last year, I found the book How to Catch an Elf through Scholastic and fell in love with it immediately! If you don’t know it, the elves and Santa go through various contraptions that are set in an effort to catch them. After reading it, I was inspired to create a fun, thematic, procedural writing unit with the book as the jumping point. If you aren’t familiar with the book, you can find it on Amazon at the link below. The unit has a few different parts to it. Students create an elf trap using recycled materials at home (or at school). Then, they create a step-by-step writing tutorial on how to catch an elf. The writing gets displayed with a cute elf craft. I also have students present their trap to the class. I don’t spend nearly enough time on our speaking and listening standards (especially the speaking part) so this was a great opportunity to have the students give a presentation about a topic they know well- since they created it. I read the book to introduce the unit on Monday. Students then begin planning what their elf trap would look like by sketching it out on provided templates. Students also receive the (included) parent letter on Monday to take home and begin working on their traps. I try to give them some class time to work so they have an idea of the items they’d like to use at home. We talk about what materials they have already, what materials they can use (old cardboard boxes and other reusable materials), what they might need to ask for (candy canes), etc. Then, they begin planning their step-by-step writing on how to catch an elf. There are several different templates included in the unit. I used the 4 step process with my second graders because I wanted to focus on writing descriptive and strong sentences. There are also 5 step process pages included as well as a first, next, then, last template. I continued to use this on Monday to wrap up our project for the day. After students plan out what each step of catching their elf will be, we work to begin to write our paragraph. I did this the next day so kids had a chance to walk away and keep thinking and make any changes before we began writing. We worked on writing each of our sentences in this box so we could turn our writing into a paragraph later. The focus of my mini-lessons were on writing strong introductions and conclusions. Students then took their ideas from their planning pages and wrote them into complete sentences with the organizer. We spent the next day doing some quick revising, editing, and peer editing before we worked to publish. 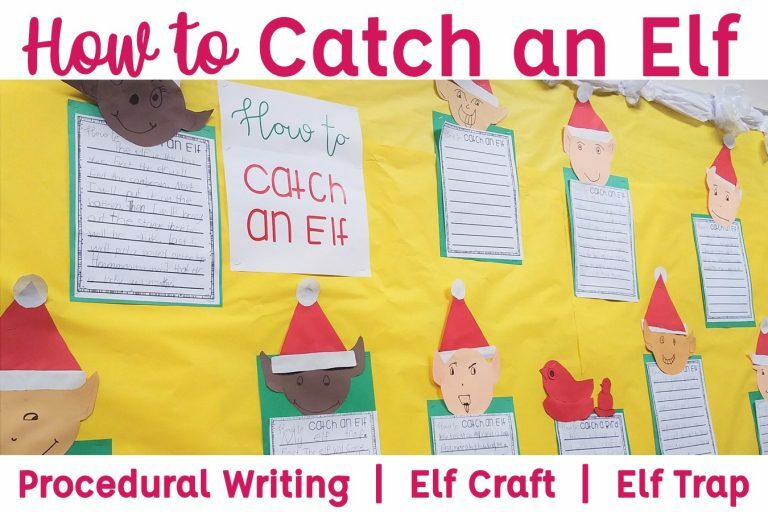 To publish, students used their best handwriting to write out their step-by-step tutorial on How to Catch an Elf using the provided lined page. On Thursday, we worked to assemble the craft. Students created their elf heads and assembled the finish product onto green construction paper. The craft includes a template for the head, the layered ears, and the hat. My students loved this project! I love that they were enjoying our writing unit and were excited to work on writing each day. I turned the writing into a bulletin board display as well. On Friday, students also presented their elf traps to the class. My students’ loved this activity! Some students really used just tools they had on hand at home. This is a box that got wrapped with wrapping paper. A doll’s bed was placed inside along with their item to attract the elf- a candy cane! Their elf traps were so creative and they did such a great job on them! I was so impressed with the mechanisms many of them used. This student’s trap had a door that raised and lowered using the suckers on the side! Some of my parents got really into the project and worked with their child to create some amazing traps! Students gave short presentations on their traps and demonstrated how they worked. This helped me work on our speaking and listening standards and gave students an opportunity to give a low stress presentation. This unit was one of my favorites to teach! My students loved creating the elf traps at home, and it gave us a chance to work on procedural writing in a fun and engaging way! You can find the unit in my TpT store by clicking here or the image below.